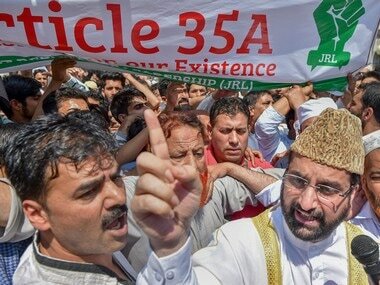 The separatist groups' protest against any tinkering with Article 35A, which bars outsiders from purchasing land or getting government jobs in Jammu and Kashmir, has somehow pushed them in a narrative trap in which they have ended up defending a law that is part of the Constitution of India, something which the Hurriyat leadership never considered sacrosanct. The Supreme Court of India will be hearing petitions challenging the validity of Article 35A on 6 August. “The fact is that the petitions challenging the special status are part of a well-planned assault on Kashmiri culture that will change the very definition of the Kashmir dispute,” says Mirwaiz Umar Farooq, who led a protest on Friday afternoon in downtown area of Srinagar against the possible abrogation of the article. "It (Article 35A) is part of our identity and any tinkering with it is an assault on the people of Kashmir, be they Muslims Hindus, Sikhs or Christians," he said. However, mainstream politicians argue that the Article 35A is part of the Indian constitution and the separatist leaders, who have been striving for "Azadi" shouldn’t play politics over it. “It is the demand of those who swear by the Constitution of India and have time and again defended it by taking the oath of the Constitution of India and strived to work for it by participating in the governance process,” senior National Conference leader and MLA, Ali Mohammad Sagar, said. With the state government sleeping over the matter, the National Conference on Friday filed an intervention plea in the Supreme Court, seeking to be included as respondents in the petition challenging Article 35A. “We filed the intervention plea in the Supreme Court in reiteration of our commitment to fight against all machinations aimed at fiddling with the State’s special status and unique political identity. National Conference will fight this battle from the forefront and will do everything necessary to safeguard the state’s special status and political rights," said Nasir Aslam Wani, provincial president, National Conference, after the plea was filed in New Delhi. The separatists groups have called for a two-day strike to highlight the issue and have been taking out protests since last week. On Friday, both Yasin Malik and Mirwaiz led protests against what they called “India’s larger design to change the demography of the Muslims majority Jammu and Kashmir". The separatists have warned the Centre of large scale protests in case Article 35A, which is coming up for hearing on 6 August, is touched. Already, around 30 trade bodies across Kashmir have warned that any addition or deletion of the article will have long term repercussions. However, the way the separatists are rallying around the issue has exposed their political dilemma. The Hurriyat leaders over the years have been refusing dialogue offers from the Government of India saying that they would not hold talks under the Constitution of India. But in this case they have come out on the streets to defend a law that is part of the Constitution of India. Mirwaiz, in series of tweets, said that no court whether of India or Pakistan has any right to take decisions about Jammu and Kashmir having implications on the overall settlement of the "dispute". Mirwaiz also said that Kashmiris will never allow tinkering with Article 35A and are ready to lay down their lives for its protection. The issue has touched sensitive chords of identity and religion in the state with even a group of lawyers in Hindu majority Jammu region of the state taking out a rally in support of the protests being held in Kashmir. Hurriyat leaders also find it extremely difficult to stay away from the debate regarding Jammu and Kashmir’s constitutional and legal relation with the rest of India. This, analysts believe, could be New Delhi’s 'ploy' to manage and lower Hurriyat Conference's bar from 'Azadi' to 'protection of special status of the state'. The active participation of Hurriyat in protests could also unnerve pro-India political parties like National Conference and People’s Democratic Party who claim to operate as a buffer between New Delhi and Jammu and Kashmir with their respective ideologies within the Constitution of India, and thus making issues surrounding Article 35A as their exclusive domain. The Hurriyat’s call for protests on Article 35A is being seen a political trespassing by the political parties in Jammu and Kashmir. It may appear as a deviation by Hurriyat leadership from their principle political stand, said Ajaz Wani, a political science professor at the University of Kashmir, but in the larger context it is the part of the resistance movement.